Happy Meal had been good all week (by Happy Meal standards...I grade on a curve), and it was up to him to pick our Friday night destination. The boy had a thing for Lemon Meringue pie, so he chose Marie Callender's for dinner. The average age of the patrons there had to be at least 63, but seniors know their pie, so who was I to complain. We ordered a couple of the burger specials--cheeseburger, fries, and a slice of pie for $8.99. I went in expecting awful...I was pleasantly surprised. The Beef: It was a blend of juicy Chuck and Sirloin. The menu claimed this: "All burgers made with USDA chuck and sirloin..." Huh? That was sort of like declaring that the beef came from cattle. USDA what? I suppose one could have concluded that, previously, Marie Callender's had been getting beef that had not been federally inspected, and they just wanted to assure us that they were now compliant with local, state, and federal laws regarding such formalities. I suppose we can never know... Anyway, the beef was flavorful, and even though the Sirloin percentage seemed relatively low, it still gave the burgers a satisfying beefiness, some complexity of flavor, and a firm bite. The beef was far better than expected. The Sear: Yeah! Marie Callender's seared the hell out of our burgers...in a good way. The sear was even, deep, and crunchy. Win! The Preparation: Our cheeseburgers were cooked on hot flat-top to a juicy Medium. The beef was ground to medium coarseness, and it was hand-formed into irregular 6-7 ounce patties. The burgers meat was treated gently enough not to create excessive chewiness in the bite. The Cheese: The cheese was as American as childhood obesity and every bit as satisfying. The cheese lent some much-needed saltiness, umami, and creaminess to the bite. American cheese really is safe and good bet when it comes to topping one's burger. 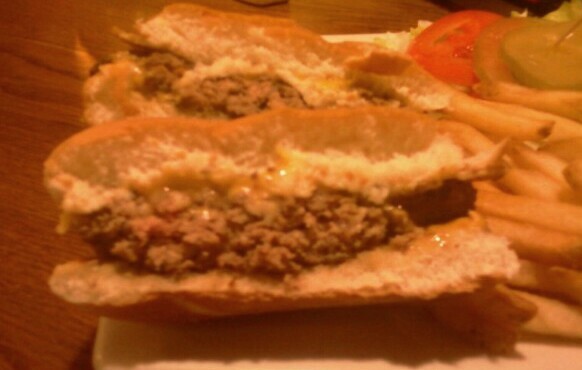 The Bun: The bun was a silent and competent beef and cheese delivery platform. It was plain, non-seeded, and under-toasted. The bun was fine, but it lent no character of its own to the dish. The Fries: These were peel-on, square cut, shoestring fries, and they were good. The fries were crisp, hot, and perfectly seasoned. The Value: A cheesebuger, fries, and a slice of pie went for $8.99 at Marie Callender's--that was a good value. 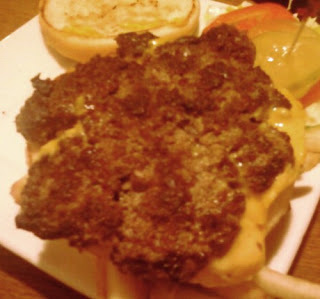 What amazed me is that Marie Callender's managed to serve up a better burger than Comme Ça did on our last visit. The beef was a higher quality...the bun was not monstrous or leathery...the sear was perfect...the cheese was flavorful...the fries were not soggy...the price at Marie Callender's was half of what we paid at Comme Ça. 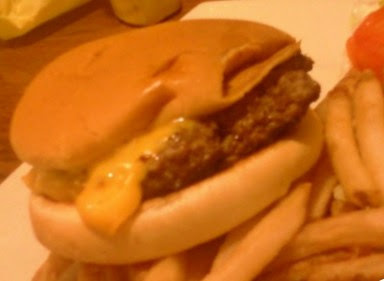 Burger Review : While Marie Callender's did not serve up a great burger, they did serve up a better than average burger. And how was the pie?